This piece of art consists of a peanut for everyday that the artist has lived. It is a “work in progress” in that each day the museum staff adds another nut to the pile. Because I’ve been thinking a lot about so-called Big Data these days, I couldn’t help but see a connection between Big Data and this pile of peanuts. 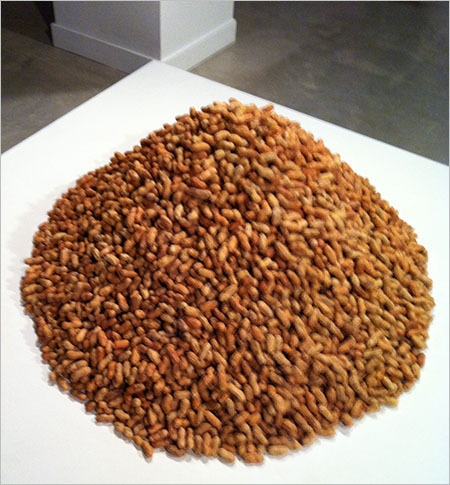 Just as this pile of nuts is an incremental representation of the artist’s days on earth, Big Data is an incremental increase in data volume, velocity, and variety. Two differences exist, however. The Big Data pile of nuts increases at an exponential rate, unlike the linear increase of the artists lifespan, and the artist hasn’t chosen to give herself a new name for arbitrary points along the growth of this pile. Data has been increasing at an exponential rate since the advent of the computer; it didn’t suddenly become big and it hasn’t passed some threshold that makes is qualitatively different than it was in the past. Jesus once taught a lesson using the parable of the wine skins. No one pours new wine into old wineskins. If he does, the wine will burst the skins, and both the wine and the wineskins will be ruined. No, he pours new wine into new wineskins. The fermentation of new wine requires a vessel that can expand. New wineskins were flexible, but old wineskins no longer had the capacity for expansion. Jesus was saying that his message was new—a departure from the past—and that it could not be contained within the paradigms of the past. It was qualitatively different, and as such, following him would require a new perspective. I’m trying to teach the lesson that’s on the flip side of this parable. Only marketers (people who are trying to sell you something) pour old wine into new wineskins. Doing so wastes the capacity of the new wineskins, because expansion is no longer needed, and it misleads buyers into thinking that they’re getting new wine that is actually old. Big Data isn’t new. The purpose of the term Big Data as it’s being used by technology vendors and most technology thought leaders is to create an illusion of newness that potential buyers can’t live without. It is a marketing campaign designed to lighten the wallets of organizations. An organization that cannot derive value from the data that it already has will not suddenly derive value from it by installing the latest technology. The business intelligence industry (and now the Big Data industry) has always been good at making promises that it rarely fulfills. Big Data is just a big, exponentially growing pile of nuts. Value can be derived from data, regardless of size, but only to the degree that you’ve developed data sensemaking skills. Only then will Big Data lead to Big Information. Ouch! But I really must agree. Big Data is just more of the same. Bigger bucket, same bits. Just give me some faster slicing and drilling and I will keep up. A trend is still a trend, an outlier is still an outlier. As a possible counter-point, though, I wonder if “Big Data” isn’t a good move for marketing the same old business intelligence. 1) Any given concept can only gain so much market penetration. But if you make an old concept look like a new concept, you have the potential to reach markets that wouldn’t respond to the old concept. 2) “Big Data” is simple, catchy, and sounds impressive. It has a lot of intuitive value for leaders who make strategy decisions but get confused by terms like “visualization” and “analysis”. I’m not exactly saying that we’re dumbing down the product. Rather, we are lowering the bar to entering the conversation. 3) Because “Big Data” is just a repackaging of “business intelligence”, most of the movers in the market don’t need to actually change anything but their marketing materials. We are still offering the exact same suite of products and services, just under a new name. No re-training of personnel or investment in platforms is necessary (unless, of course, you’ve let the move towards unstructured data pass you by). The same tools under a new name suffer the same flaws. The only major difference between “big data” now vs then is that we now have bigger and faster machines and flashier technology to run on the machines. But, we still have the age old question. What business value do you wish to get out of the data? The sales person will of course inform you that “all” your competitors are using big data and you had better use it in order to survive. But, unless you have a good business strategy, all you will do is enrich the big data sales person and enrich the computer storage vendor. Interesting way to look at data, peanuts and wine? I like it! I also agree that how you use your data (strategy) is important. Storing and retrieving it is also. What is the relevance of data if it’s old and outdated or inaccessible? In some instances old data is useful (trending) etc. However, a company needs to leverage that data too. Hi–you might be interested in my talk, Little Data: How traditional statistical ideas remain relevant in a big-data world. Indeed, we seem to share a similar opinion that people should be focusing on effective data sensemaking rather than increasing volumes, velocities, and varieties of data. No matter how much data we source, to wrap our heads around it we must usually reduce it to representative sample (i.e., little data). Unfortunately, I couldn’t follow much of the information in your slides without the narrative that you must have delivered when showing them. I’m sorry that I couldn’t see this presentation in person.